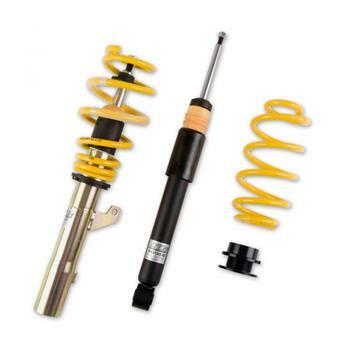 Once installed, the ST X coilover can be easily adjusted using a polyamide ring on the galvanized, multiple-sealed strut. Adjustment is different for each car, but typically you can expect between 35 and 65mm of lowering on both the front and rear axles. For lowered cars as standard (such as the BMW E9× 3-series) the ST X coilover features a range of 30 to 60mm (front axle) and 25-55mm (rear axle). Designed in conjunction with KW Germany, ST X coilovers deliver a sporty handling by reducing the cars bodyroll during compression as well as improving agility when driving fast. The high-quality production of each ST X coilover includes a low-friction and pressure resistant housing alongside a chrome-plated piston rod for maximum longevity. A mono block guide and ST seal package ensures the twin-tube dampers remain free of dirt particles in all weather conditions.